Here is a very small and slightly cropped photo taken from the official report and posted on the Railways Archive website (http://www.railwaysarchive.co.uk/eventsummary.php?eventID=125). This photo gives a good impression of the damage caused by a near immovable object being struck by a near irrestible force! Note in particular that the lead Pacific "Conqueror" is visible bottom left, and the bonnet of the pusher Diamond T is just visible bottom right. The "L"-shaped piece of debris at the top centre of the photo is, as far as I can determine, one of the rear swan-neck girders from the trailer, which has come to rest approximately 25 yards further from the point of impact than the locomotive. 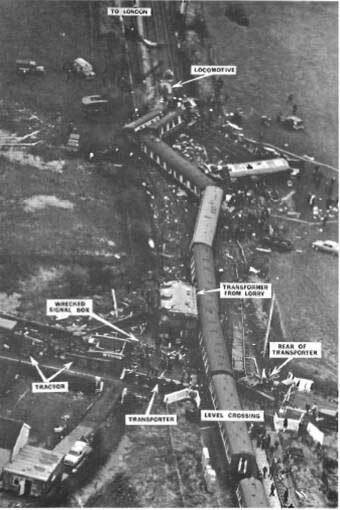 Sadly 11 people, including two crew in the locomotive cab, died in this accident, although had the circumstances been ever so slightly different and had the Wynns drivers not managed to move the last few yards, the outcome could have been far worse. Hi lads. I require colour photos if possible of the following R Wynn's Diamond T's FDW 533 & RDW 976. I have the photos from Les's book, but require more of these two vehicles please, not interested in any other Diamond T, just these two please. Thanking you in advance, if you have any info on either or bot these T's I would be grateful in hearing it, also what happened them them . It's been a very long time since this thread saw any action, but since the posts I made above I now believe that the rear tractor involved at Hixon was one of the Anderson-cabbed DT's, since photos have come to light which suggest the Anderson silhouette rather than the small cab silhouette. I think that this narrows it down to one of three tractors, but I still would be interested in knowing which it was if anyone knows. Is it Wynn who is reputed to have bought Diamond T's after seeing the skid marks they left on the road? There was a BBC radio programme about the company some years back.